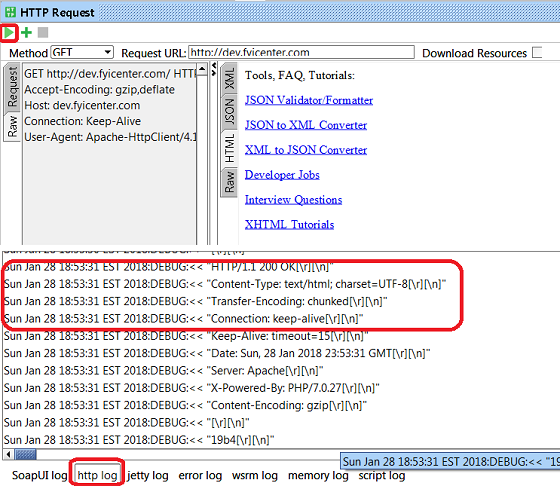 How to view HTTP request and response logs in SoapUI? When you run a test, SoapUI records some debug message for each HTTP request and response in the HTTP log. You can follow this tutorial to see view HTTP log after running a SoapUI test. 5. Click the "http log" tab at the button of the SoapUI window. You see HTTP request and response debug messages recorded by SoapUI. ...2018:DEBUG:>> "User-Agent: Apache-HttpClient/4.1.1 (java 1.5)[\r][\n]"
...2018:DEBUG:<< "Date: Mon, 29 Jan 2018 00:36:14 GMT[\r][\n]"
Use right-mouse click on log messages to copy or save debug messages.